Contents Foam adhesive backing is included with your order for easy and permanent installation. Solidly built slider signs combine the versatility of two signs in one. Watch the video and take apick from our many stock options or customize your own. Notify visitors of your availability with this Do Not Disturb / Open slider sign. High bond adhesive backing is included with your order for easy installation. • "Counseling" panel slides back and forth, revealing either "Do Not Disturb" or "Open". 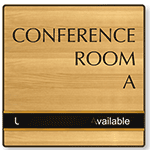 • Select a gold, silver, or black frame for your Slider sign. • Foam adhesive backing is included with your order for easy and permanent installation. Magnetic backing is an option (at an additional cost). • Sign frames are available in matte black, silver, or gold aluminum. I have received several comments on how professional the sign looks. It fulfills the purpose for which it was purchased and was easily mounted. Awesome - they look and work GREAT! thanks for a great product at a good price!